Pemberton had a workhouse from 1731, as did Wigan and Ashton-in-Makerfield from the following year (Hitchcock, 1985). A parliamentary report of 1777 recorded local workhouses in operation in Wigan (for up to 200 inmates), Dalton (20), Pemberton (60), and Standish with Langtree (40). The Wigan workhouse was at the north side of Frog Lane at the west of the town. Wigan Frog Lane site, 1849. Another workhouse stood on the Liverpool Road to the south of Hindley. County of Lancaster: Abram, Ashton in Mackerfield [Makerfield] (2), Aspull, Billinge Chapel End, Billinge Higher End, Blackrod, Dalton, Haigh, Hindley (2), Ince, Orrell (2), Parbold, Pemberton (2), Shevington, Standish with Langtree, Upholland, Wigan (5), Winstanley, Worthington, Wrightington. The population falling within the Union at the 1831 census had been 58,402 with parishes in size ranging from Worthington (population 124) to Wigan itself (20,774). Wigan workhouse from the south-east, c.1906. From 1930, the former workhouse became Frog Lane Public Assistance Institution providing care for the elderly and chronic sick. After the setting up of the National Health Service in 1948, it became Frog Lane Welfare Home and later as Frog Lane Hospital. It finally closed in around 1970. The buildings were demolished in the 1990s and housing now occupies the site. 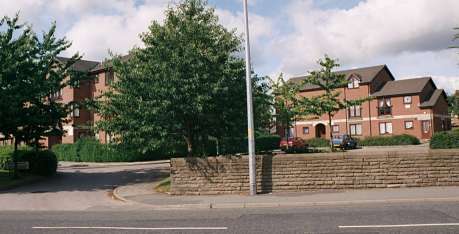 Wigan former workhouse site from the south, 2001. In 1906, Wigan Union opened a poor law infirmary on a separate site at the east side of Upholland Road. Wigan union infirmary site, 1928. 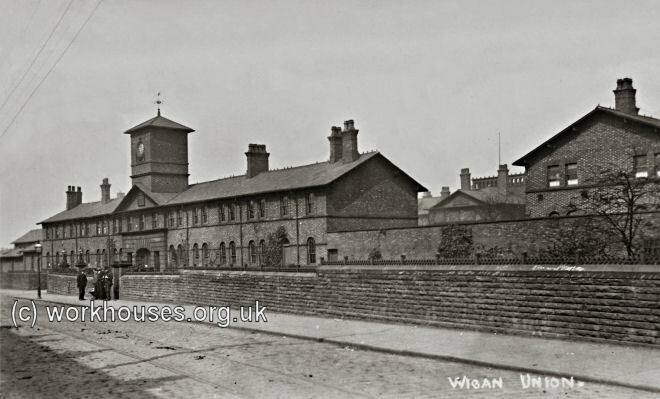 Wigan union infirmary from the west, c.1918. The hospital later became Wigan's Billinge Hospital. It finally closed in July 2004.